Chariton Schools Superintendent Larry Achenbach speaks to the Rotary Club of Chariton in the Elbow Room in the lower level of the Hotel Charitone Friday afternoon. 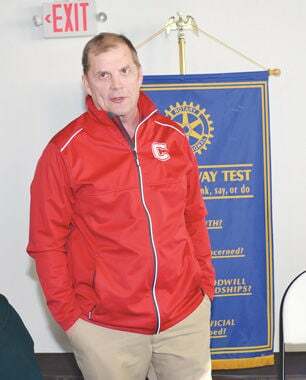 Chariton Schools Superintendent Larry Achenbach was the guest speaker at the Rotary Club of Chariton’s meeting this past Friday at the Elbow Room, which is the lower level of the Hotel Charitone. Rotarian Joe Sellers was the host of the program. Achenbach spoke about his career in education as well as his qualifications to be a superintendent. He also spoke about the three central goals of his educational philosophy and his focus on moving forward with the District. Achenbach signed a three-year contract to be superintendent on Jan. 24. Achenbach is married and his wife Kathy works for the Great Prairie Area Education Agency (AEA). He has two stepsons including T.J., who is a computer programmer in Des Moines, and Matthew, who works for Quality Ag in Albia. Achenbach is a former coach who said he loves the Iowa Hawkeyes, New York Yankees, Chicago Bears and Chicago Cubs, in that order. Achenbach stated the qualities that he brings to the superintendent position including being a strong visionary with excellent problem solving skills. He said he also possesses strong communication and organizational skills, is an excellent supervisor and motivator, is skilled in strategic planning and scheduling, and has good knowledge of curriculum development and managing staff. Achenbach went over his three chief educational goals, the first of which is creating a safe environment for everyone. “The second goal is putting students first. With the decisions we make every day, we have to make sure that we put students first and do what’s best for the students,” he said. Achenbach’s third main goal is using the TEAM (Together Everyone Achieves More) approach. “I believe in working together to provide and make opportunities for everyone to be successful. By working together, it strengthens the process, gives ownership, and lets everyone have ownership when necessary,” he said. The TEAM approach includes students, staff, administrators, parents and the community. Achenbach spoke about when the Chariton superintendent position came open this past spring and why he decided to take it when he was offered the job. He also gave his thoughts on Chariton so far. Read the February 5, 2019 edition of the Chariton Leader for the rest of the story.